The national standard of the country of Tonga is made up of a red base with a white square in the upper left corner. There is a red cross centered on top of the white square, which is positioned in the canton. The meaning behind the cross is the people's belief in the religion of Christianity. The red stands for the blood of Christ that was shed when he was crucified. Like other standards and such, the white stands for purity. This flag originated in the sixties of the 1800s and was officially adopted in 1875. This makes it one of many historic flags. The country’s constitution of 1875 says that the flag of Tonga should never be changed. Tonga gained independence in the month of June of nineteen seventy. 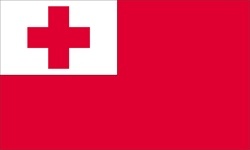 Tonga used to fly a flag from Tongan flag poles that was very similar to the Red Cross flag.